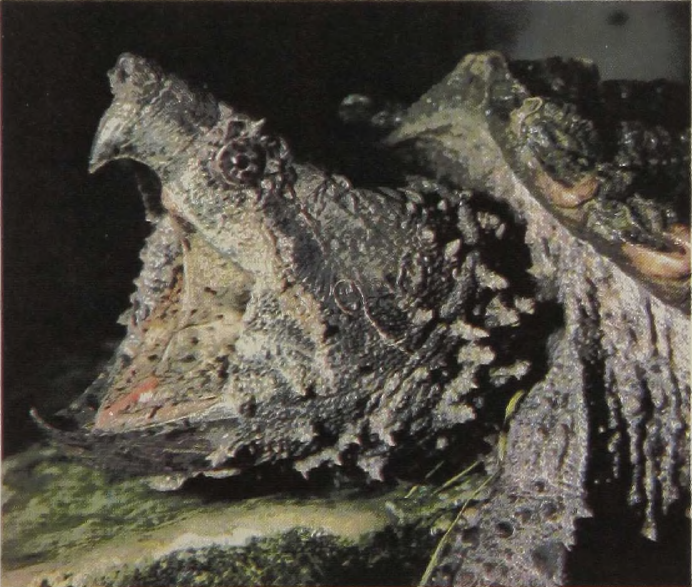 The Alligator Snapping Turtle of the southeastern United States is the largest North American freshwater turtle, the record specimen weighing 236 pounds. These turtles live about 60 years. They are primarily bottom walkers, rather than swimmers, in the slowly moving waters where they live, even though they do have to stretch their necks to the surface to take in air. The shell is folded into three ridges, has jagged edges, and is quite rough. It tends to be covered with algae, helping to camouflage the animal. 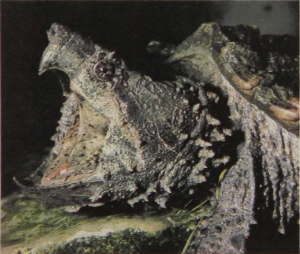 This snapper’s feeding method is most peculiar. He has a long, loose protuberance at the end of his tongue: this process may be filled with blood, which colors it red; when wiggled, it resembles a moving worm. The hapless fish that swims into the open mouth to grab this “worm” is caught between the turtle’s closing jaws.